We can’t control the big events in life. But for the details, it’s a different story. Details can be crafted with precision. Details can be perfect. In 1860 in the small town of Sonvilier, Switzerland, Louis-Ulysse Chopard realised the power of detail. And through his dedication to quality, creativity and audacity, he established one of the most respected companies in the world... Chopard. Renowned for their precision and pure inimitability, Chopard’s watches, jewellery and writing instruments are in a class of their own. Masculine yet elegant, Chopard's Racing Black and Palladium Ballpoint Pen pays homage to Chopard's long history of involvement in motor sports. This stunning writing instrument boasts a sleek black glossy, resin barrel with a shiny palladium-plated trim that simply exudes sophistication. 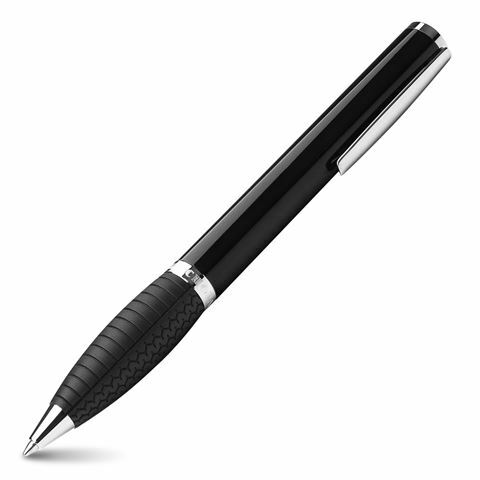 The smooth, streamlined contours of this luxury pen are sheathed in black rubber with a tyre-tread motif, offering a refined contrast to the pen's polished accents. It's the ultimate accessory for the distinguished man with a taste for all things classic and timeless. Bring the codes of classic automobile design to the art of writing, with Chopard. Barrel made from glossy black resin, with a shiny palladium trim. Centre ring is embossed with the Chopard name. Tyre tread design on the rubber pen grip and base. Beautifully presented in a Chopard gift box.